I saw an excellent YouTube video from Alan W2AEW and thought I’d have a go at making a prettier version of the tool myself. After all, checking 50 Ohm coax cables is a common task for an amateur radio enthusiast. Alan’s video says it all, but here’s a top-level overview. You feed a fast-edged pulse into one end of a coax cable and use your oscilloscope to measure the time it takes for the pulse to travel all the way to the other (unconnected) end, bounce, and come back. You thought the speed of light was insanely fast, right? Well, not so fast that we can’t get to grips with it travelling down a coax cable on your bench! Actually, it travels at about 0.66 times the speed of light down common-or-garden RG58 coax, but we’re still in the same ballpark as c. If you know the characteristics of the cable, you can calculate the length of the cable (or the distance from your measurement point to the first break in the cable). The circuit described in Alan’s video and this article makes such a fast-edged pulse. With this setup you can measure the length of cable, find breaks in cable and also tell if your cable has become waterlogged. You can also characterise a sample of cable (assumed to not be defective). The fancy-schmancy name for this trick is Time Domain Reflectometry. People who lay cables for a living may have a dedicated instrument that does this – they are not cheap. My budget for this is about €20 – and I’m making a pretty one – Alan’s budget was more like $2 and some parts bin components. Of course, you will need an oscilloscope to use this gadget. You will also need BNC tee connector, a 50 Ohm impedance BNC-BNC cable and a 50 Ohm termination for your ‘scope. The cheap solution to the 50 Ohm scope termination (as opposed to something supplied by Tek, Rigol or whoever) is another tee and a 50 Ohm end plug. Those old enough to have worked with Ethernet when it was a coaxial cable will remember this setup. You’re going to want to be using a fast-ish ‘scope for this game. If all you have is a 25 Mhz oscilloscope, two fast edges separated by 10ns will all be a bit of a blur so you’d be limited to making more rough measurements of cables at least ~10m long. If you’re set up with 100MHz or more, you’re good. Alan had a nice 350 Mhz Tek ‘scope in his video. Boy, I wish there were some of those on eBay in my part of the world! 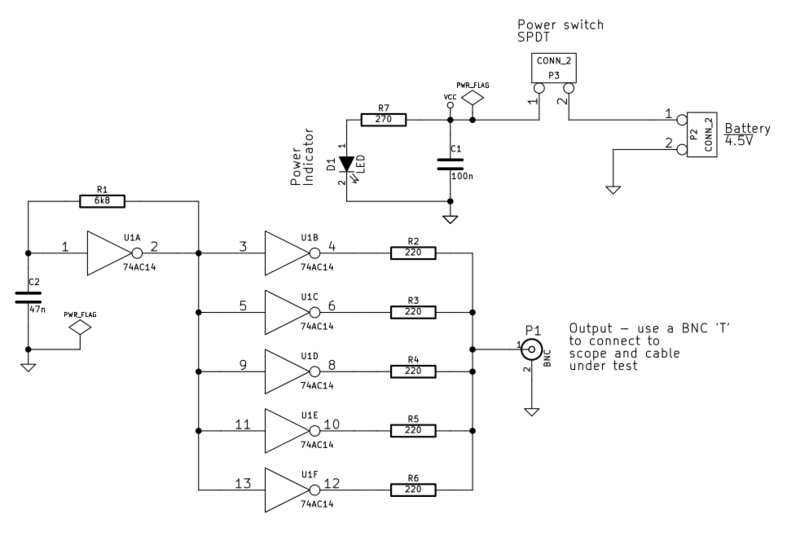 Here’s Alan’s circuit – I’ve just added a switch and an LED to know that the battery’s good when you switch the unit on. 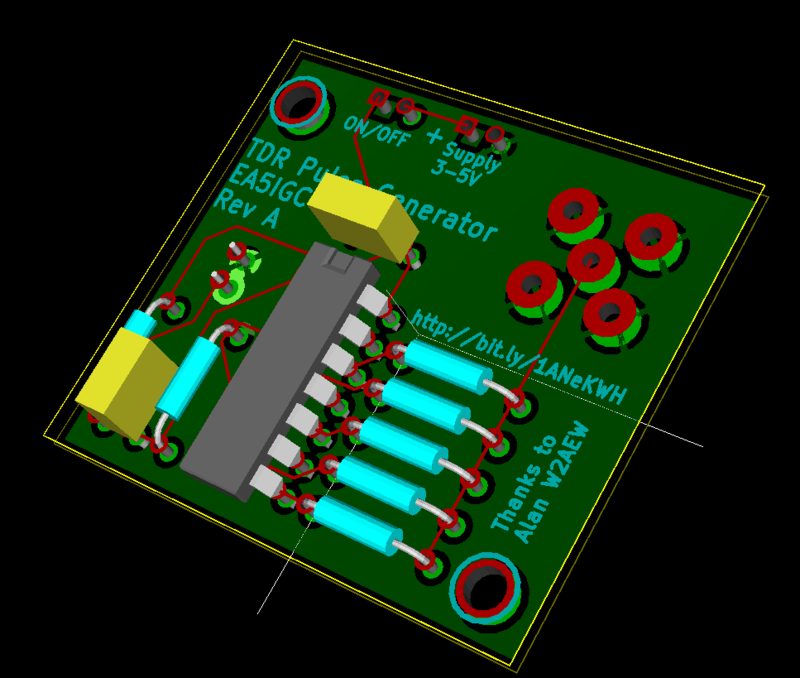 I used the excellent, free, multi-platform KiCad for schematic entry and PCB layout. 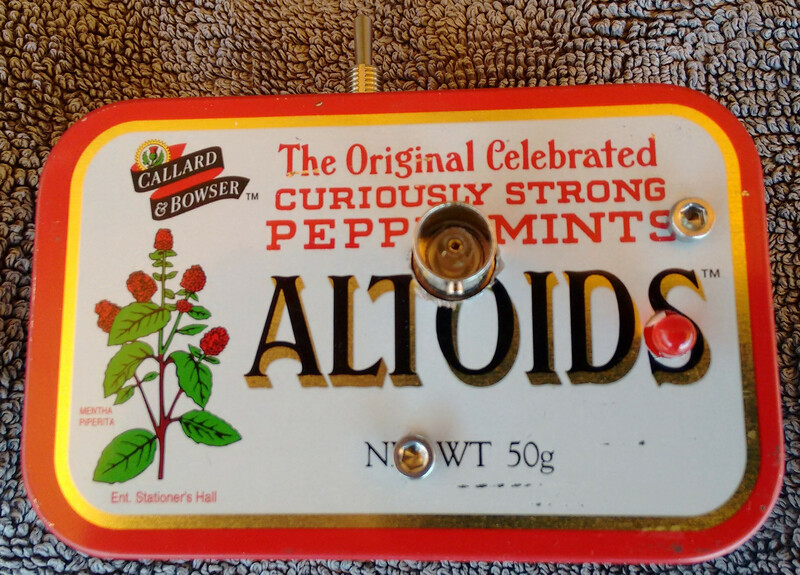 The board is designed to mount inside the lid of an Altoids tin such that the top (with resistors, etc.) side faces inwards ‘towards the mints’. Therefore you mount the BNC connector and the LED on the back of the PCB so that they poke through holes pierced in the tin lid. 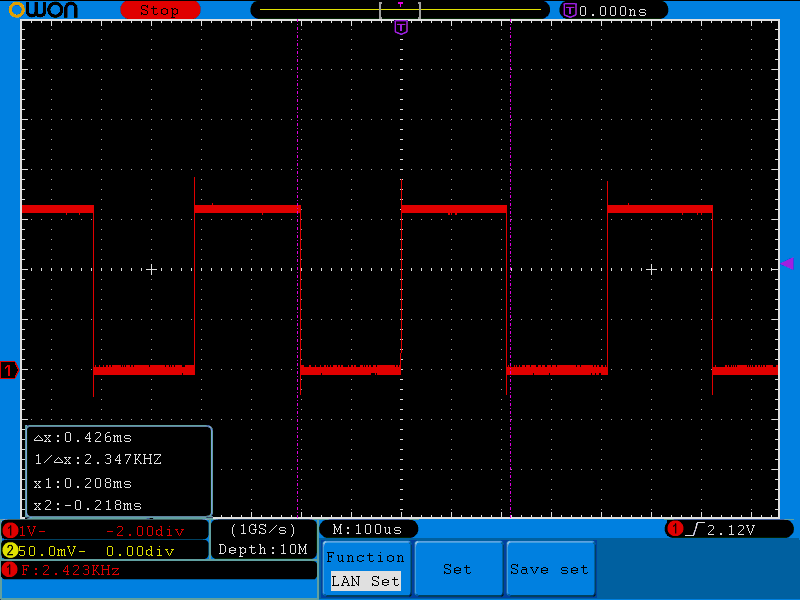 The board is 2-layer with all signals routed on the top layer and the bottom layer 100% ground plane. The board dimensions are 38x42mm. I used the awesome Dirt Cheap Dirty Boards to make about a dozen boards for $14. Shipped. You can order some boards for you and your friends here. I ordered the PCB’s just before Chinese New Year which didn’t help their speed to arrive in my hands – about 6 weeks from file upload to receipt. On the plus side I got a nice little $1 discount in the traditional red envelope by way of saying “Kung Hei Fat Choy!”. In fact, I see the oscillation frequency should be 0.8 /(R C), which gives 2.5kHz for the values I’m using and the values in Alan’s circuit. Hmm. I wonder why he said 5-6 kHz? Perhaps the hysteresis levels for 74AC14 are different. 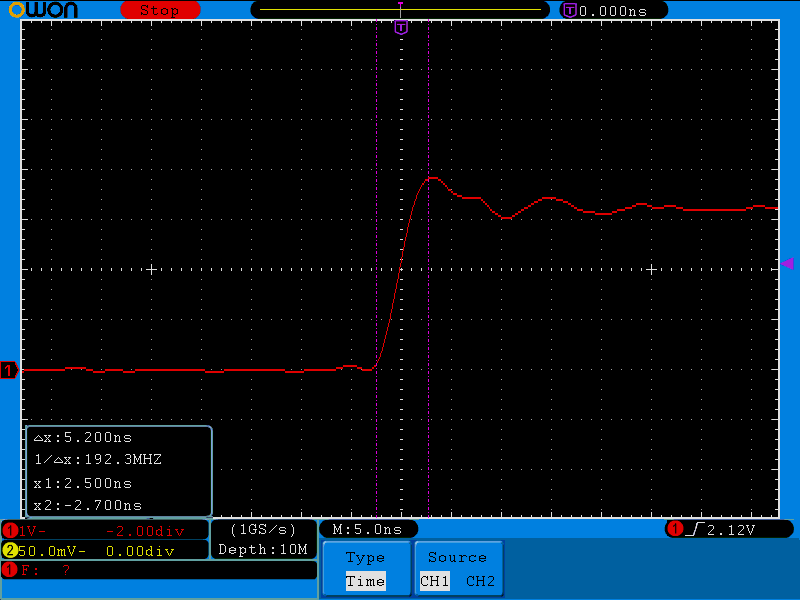 Never mind, 2.5kHz is just fine. I get the same sort of ringing that Alan got on his build, but, like he said, we don’t care – it doesn’t matter for this application – we’re all about fast edges here. I found that BNC connector really hard to solder, it just didn’t want to wet (before you ask, I used real Multicore Esrin 370 from Digi-Key). I were doing the PCB again, I’d put 3 mounting holes in the layout straight away before placing components. 2 mounting screws is a bit how-ya-doin’, as Dave Jones would say. 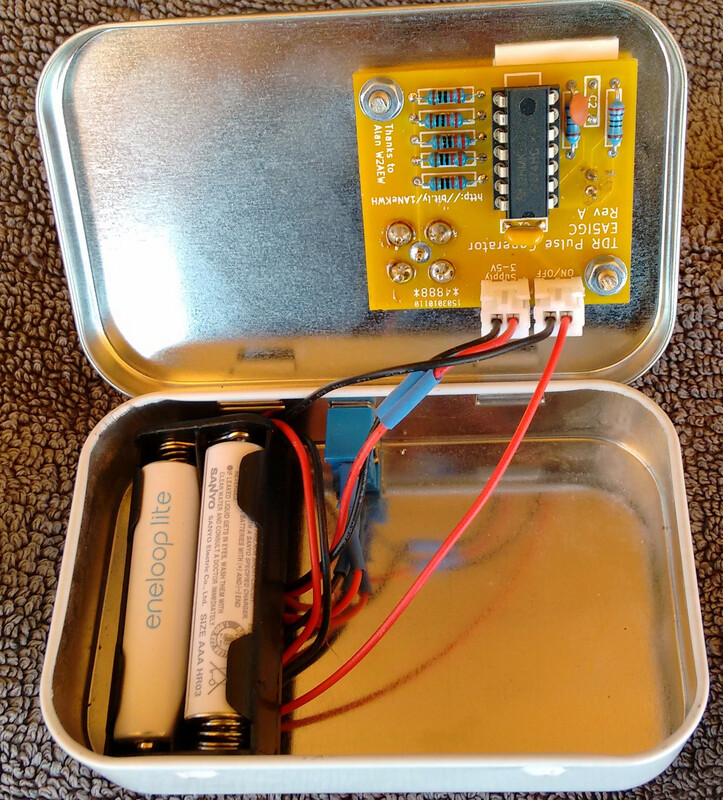 You may notice some double-sided sticky foam that I bodged between the PCB and the Altoids tin as a workaround. 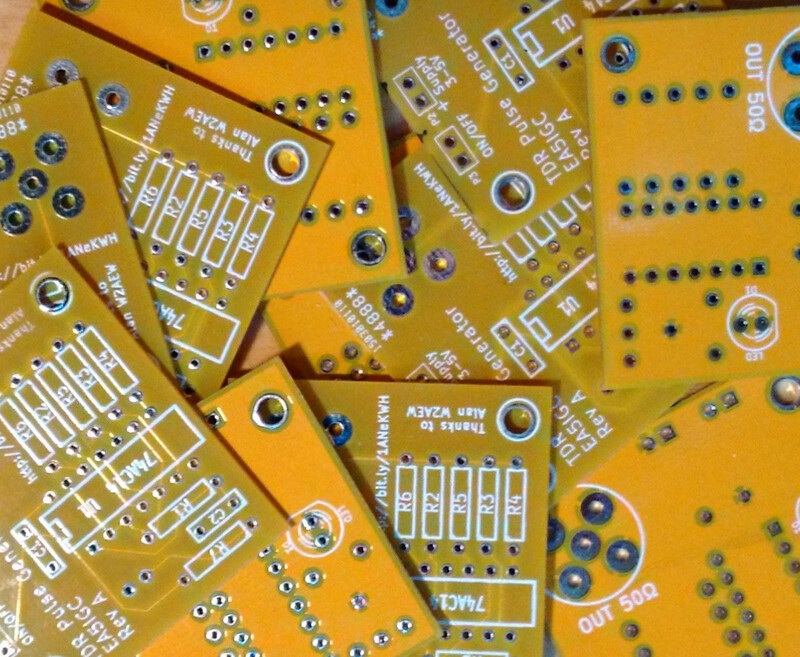 If you simply must have a PCB today and / or like to etch your own PCBs, here are some SVG files that might help you do that. 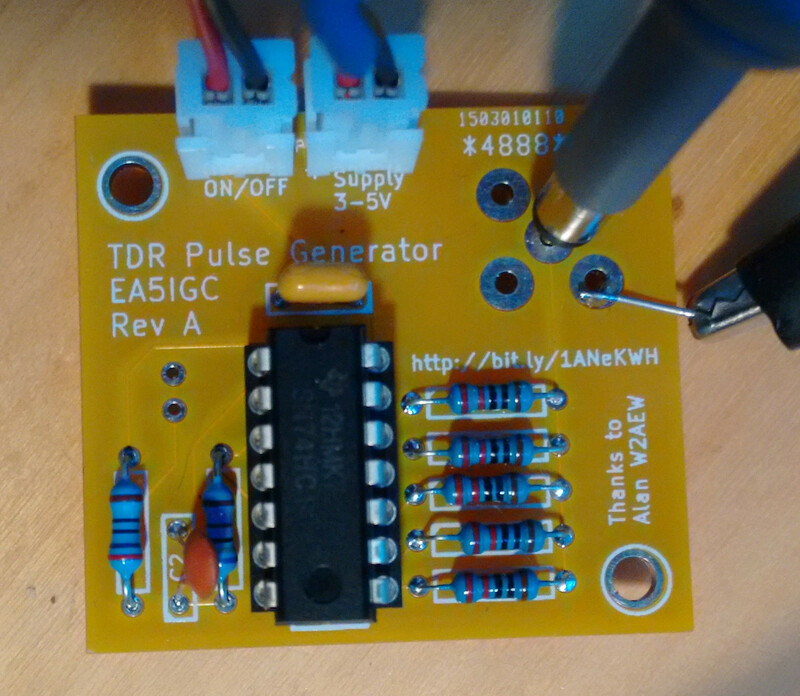 Update 8 June 2015: I sent one of the PCBs to Alan W2AEW and he built and tested it on his top-notch Tek MSO. Here’s his video results. Spoiler: the PCB version works as well as the Ugly / Dead Bug construction.